Seeing a freighter on the Cuyahoga River is like watching a building come to life. At first, the ships, up to 195 metres long and carrying as many as 20,000 tonnes, blend in with the visual jumble of buildings, bridges and beams that make up Cleveland’s skyline. Then you notice their slow, silent movement. You double-take because the water around them is flat and still, but eventually they pass, leaving swirling eddies to be navigated by crews of rowers. There was a time this would have been unthinkable — not just that marine traffic would slow to this degree, but that anyone would use the water for recreational purposes. A T-shirt in the visitor’s centre gift shop features a skeleton riding an orange wave. Burning River Surf Club, the shirt reads, a nod to the polluted river catching fire in the 1960s. The event spawned at least three pop songs and one beer. The fire started on the banks between two steel mills. One, Republic Steel, is no longer there. 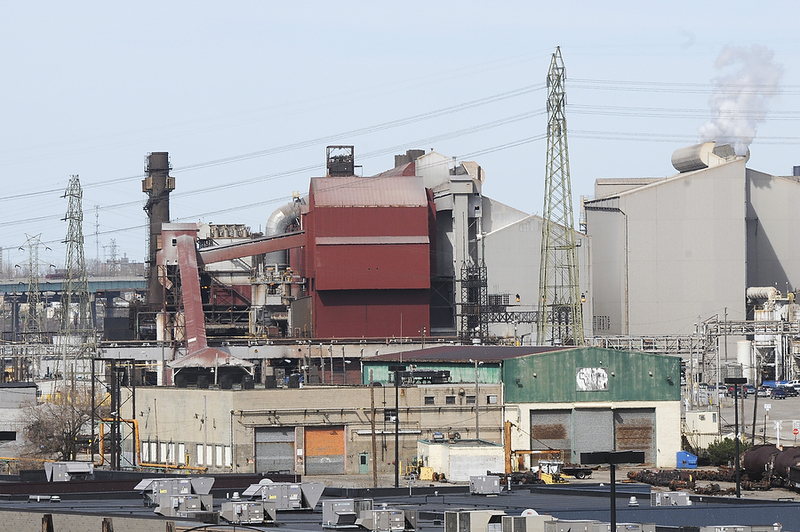 The other, Jones and Laughlin (now ArcelorMittal) employs 1,900 people at the site. The surrounding neighbourhoods still show evidence of their working-class roots. 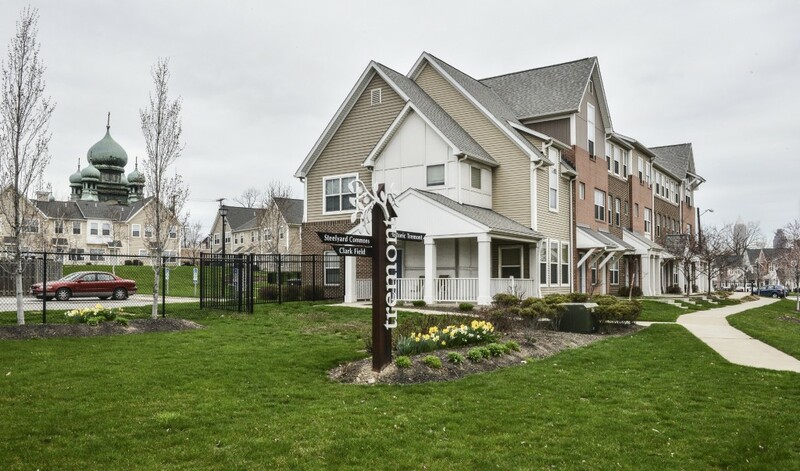 Slavic Village was at the centre of the 2007 foreclosure crisis. Another neighbourhood, Tremont, is going through a condos-and-cafés revival. 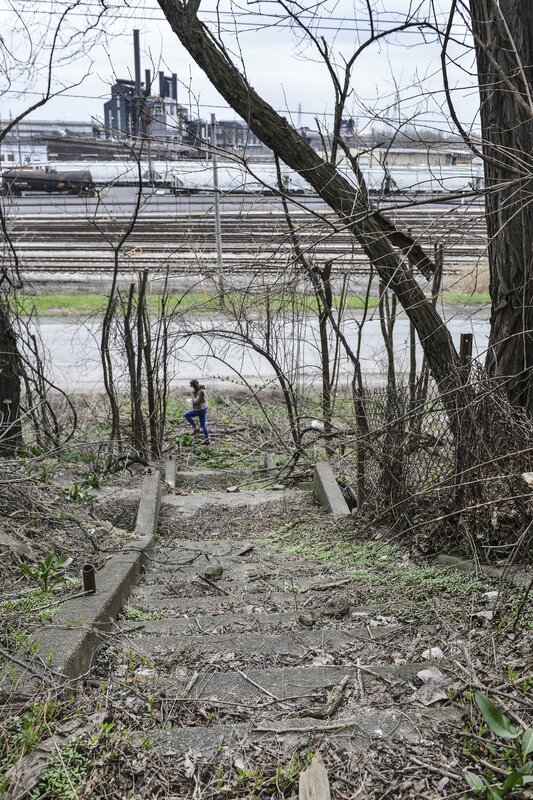 But if you push through the grass at the side of Quigley Road, you’ll find remnants of the old concrete staircase used by armies of employees who took them down to work each day. If you drive the I-77 at night, you can still see the glow of blast furnaces reflected in the clouds overhead, but the operation is much smaller than it was. The footprint of the old finishing mill is now occupied by shopping centre Steelyard Commons. Target and Home Depot try to reference the history of the site, with exposed steel girders and the same distinctive rooflines as rolling mill buildings. They’re dwarfed by the blast furnaces of ArcelorMittal, but the Commons sees more people on any given day than the mill does. Between the two is the Towpath Trail, a dedicated 129-kilometre path that runs from Cleveland to Akron. It’s one of many such paths to be transformed by a rails-to-trails program focused on converting sections of industrial land into cycling and running trails. The estimated cost for the 1.9 kilometers that runs through the former steel site, including two tunnels and an interpretive centre, was $1.5 million. It’s a relatively low-cost way to bring those places back into the fabric of the city, says Jordan Yin, author of Urban Planning for Dummies. “I think everyone’s first choice is to have these sites be economically productive but that’s not always an alternative,” he says. When the Towpath is completed in 2016, it will run 161 kilometres from Lake Erie into central Ohio. Because it crosses municipal and park boundaries, there were multiple agencies involved in the towpath’s creation. One of these is Cleveland Metro Parks, which is also responsible for the Steel Heritage Center, a mini-museum inside an old brick clock tower at SteelYard Commons. 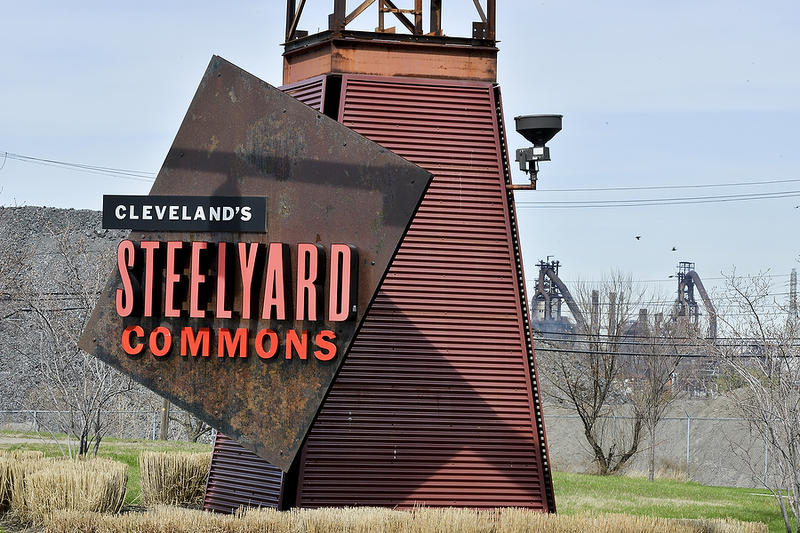 SEE: SteelYard Commons Photo Gallery and other Cleveland scenes here. On weekends, an interpreter talks about the handful of artifacts inside — raw ore pellets and a fire suit. Outside, the building is surrounded by pieces donated by ArcelorMittal — a steel coil, an ingot car, a decommissioned bottle car. Through the chain-link fence that divides the mill from the Commons, functional bottle cars ferry molten metal that gives off plumes of orange smoke. Mostly, the centre draws locals. Curious cyclists stop in. Towpath runners take a break and read the interpretive signage. And there are shoppers who have always wondered about the building, which seems out of place among the big box stores. Before the Commons was built, there was no place near the core where downtowners could get groceries, says Yin. Cleveland got its first downtown grocery this year, when Heinen’s opened in the former 1905 Cleveland Trust Bank Building. SEE: Heinen’s Grocery Photo Gallery here. Walking into the store is like walking into a museum. 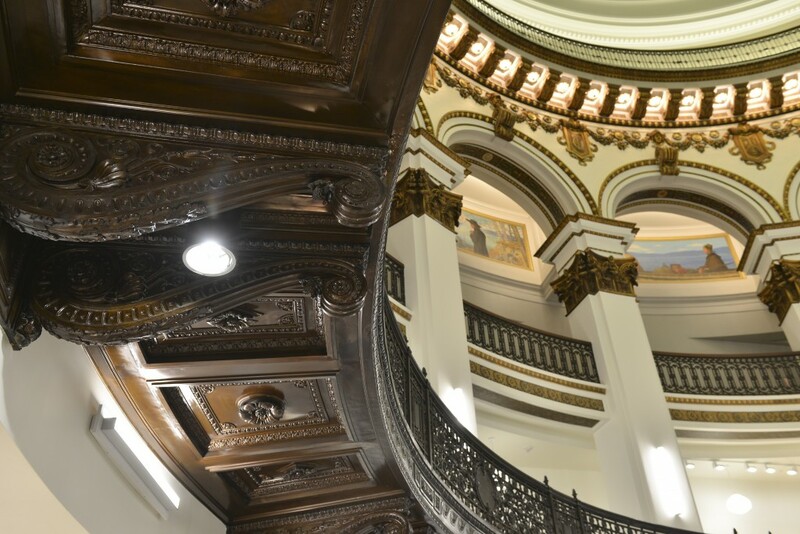 The main entrance opens onto a magnificent rotunda, with a soaring stained glass dome, marble columns and a series of murals by Francis Davis Millet, an artist who died on the Titanic. Below is a luxe lunch counter. The second floor balcony is a wine and beer store that carries microbrews and hosts evening wine and beer tastings. The actual groceries are shelved down a hallway to the left. Community involvement is key in helping preserve and adapt surplus or abandoned buildings, says author Yin. For decades, industrial land was the responsibility of one company with a single, profit-based focus. Now it’s being handed over and left open to interpretation. Sometimes, the buildings themselves are so task-specific they can’t be reused. Sometimes they can. 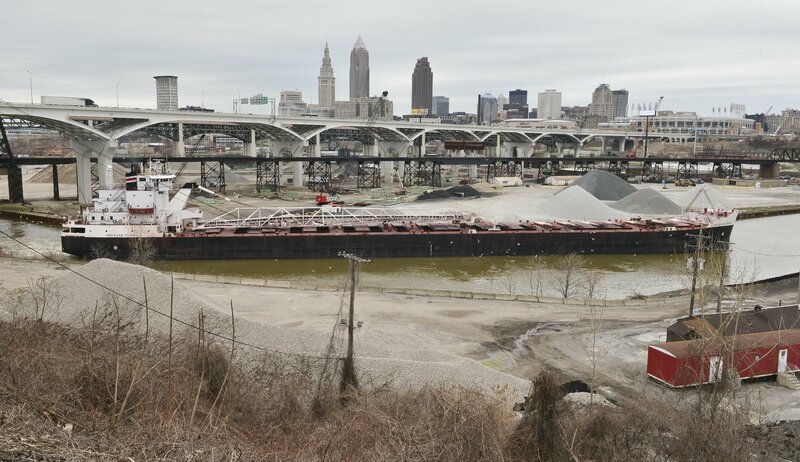 It’s pricey, but in the U.S., the Environmental Protection Agency, which was set up shortly after the 1969 Cuyahoga River fire, helps with funding. . There are also state incentives. For the most part, though, no one is going to write a cheque to make everything go away. Communities that get their own hands dirty tend to be recognized by businesses and philanthropists. The private sector likes to invest where there’s public enthusiasm. Special agencies, including nonprofits and redevelopment organizations, neighbourhood associations, land trusts and port authorities, can play a role. 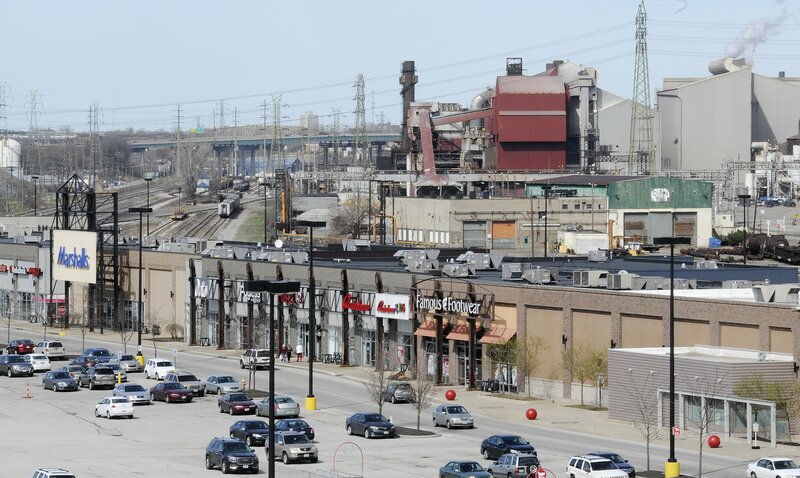 Here in Hamilton, the Hamilton Port Authority, which has expressed interest in the U.S. Steel lands, has drawn companies including Bunge and the Arts & Science Brewing Company, but also dropped the Fisherman’s Pier Project it announced in 2003. That project would have seen land around the lift bridge transformed into a kind of mini Granville Island, with retail, restaurants and outdoor concert space. 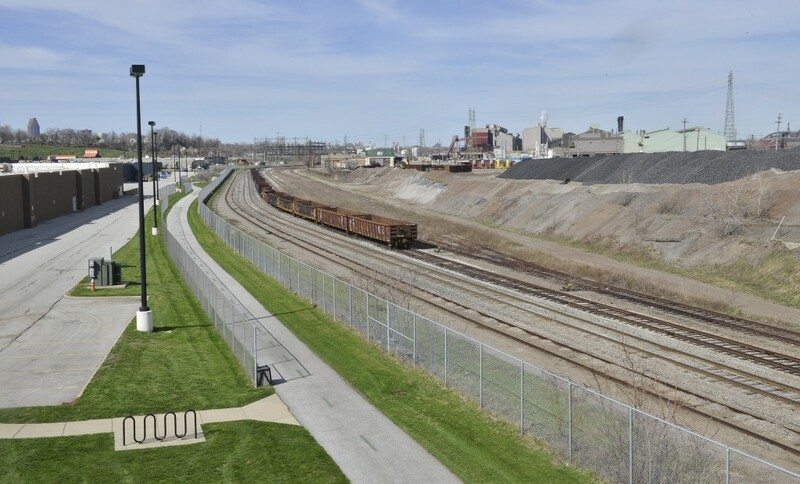 When various issues proved too challenging (operational, engineering, financial), the plans were dropped in favour of focusing on the economic development aspects of the Hamilton Port Authority’s mandate. Since 2000, the Waterfront Trust has managed Piers 7 and 8, though 2014 marked its seventh year of financial losses. In Cleveland, they have Team NEO. The organization was formed in 2003, when business leaders and various local chambers came together to spur economic development. Its goal is to attract out-of-state business and new technologies, which had already been growing in the city. From 1990 to 2015, manufacturing jobs in Cleveland’s 18 counties dropped from 453,000 to 273,000 workers. Health-care employment, however, rose from 196,000 to 319,000 jobs. Professional, scientific and technical services provided an additional 50, 000 jobs. The city has always had a bit of a leg up on other rust belt cities. When the sky was falling on the steel industry, Cleveland had something of a shelter. Yes, it was manufacturing-based, but there was greater diversity than in Pittsburgh or Youngstown. In the ’70s, Euclid Avenue was alive with the constant activity of bottling factories, bakeries and machine shops. But steel didn’t just affect the steel industry. It hit the businesses that served it. Those bakeries and bottling factories are gone, but in Cleveland, they’ve been replaced. 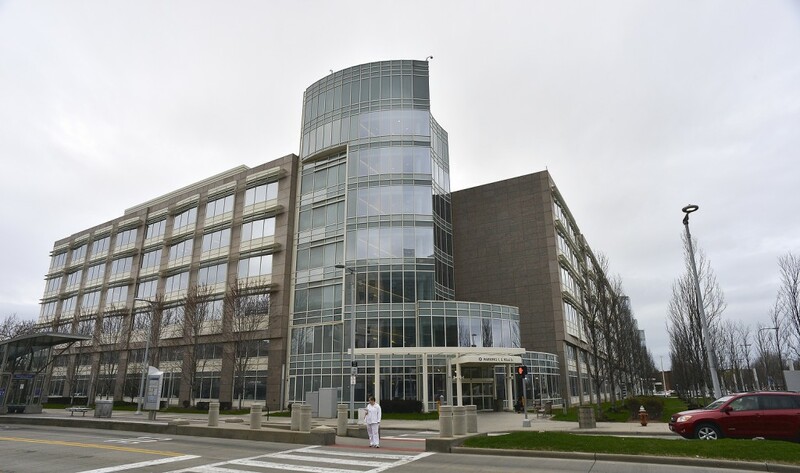 The Cleveland Clinic is a non-profit academic medical centre. It’s the second largest employer in the state of Ohio. Health care has gone up 64 per cent since the ’90s. The clinic’s downtown campus feels like a city inside the city. There are eight community hospitals and more than 75 outpatient locations in Northern Ohio. Like Hamilton’s McMaster University, the clinic integrates clinical and hospital care with research and education. In 2013, the clinic provided a total of 93,560 jobs, with a total payroll of $5.9 billion in wages and benefits. This dwarfs the employment provided by the mills today and at any time in the past. Steel has its place. And because it’s so easy to recycle, it’s not going to go away. That’s not the issue. The issue is it takes far less people to make it. “What you hear in Pittsburgh is ‘we’re good with our hands,’” says Yin. “You’ll hear that in Buffalo, you’ll hear that in Pittsburgh, you’ll hear that in Cleveland, you’ll hear that in Detroit. Our workers know how to make stuff, we just need to get them making the right stuff. You’ll hear that all over the industrial Great Lakes and we don’t quite know how to do it yet. It’s not the same thing it needed 100 years ago.